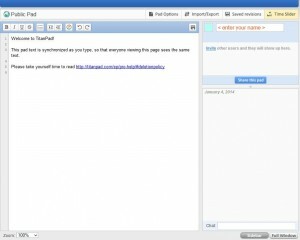 TitanPad allows users to work and type in a document at the same time. There is no signup required. Simply click on “Create Public Pad” and a “new document” will open. You can import a document or just create new text from scratch. You can add users to this pad by simply “inviting” them via email. It provides eight distinctive colors for each person to use. After you finish you can export the document as Word, HTML, PDF or plain text. This is useful if your team is on a bridge line and conference line and need to collaborate on a document in real time. Or need to track meeting notes quickly. No waiting to get an online meeting set up or Google Doc started.